Global cognitive and memory enhancer drugs market expected to reach around USD 6.98 billion by 2024, growing at a CAGR of 8.7 % between 2018 and 2024. Smart drugs and cognitive enhancers are drug substances that improve cognitive function, memory, and creativity in healthy individuals. The report covers forecast and analysis for the cognitive and memory enhancer drugs market on a global and regional level. The study provides historical data from 2015, 2016, and 2017 along with a forecast from 2018 to 2024 based on revenue (USD Billion). 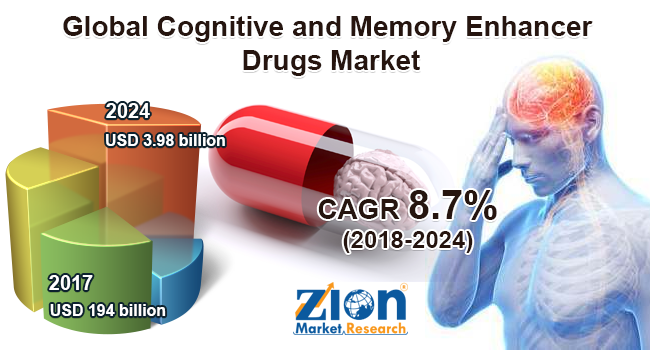 The study includes drivers and restraints for the cognitive and memory enhancer drugs market along with the impact they have on the demand over the forecast period. Additionally, the report includes the study of opportunities available in the cognitive and memory enhancer drugs market on a global level. In order to give the users of this report a comprehensive view of the cognitive and memory enhancer drugs market, we have included competitive landscape and analysis of Porter’s Five Forces model for the market. The study includes a market attractiveness analysis of all the segments related to the market. The report provides company market share analysis in order to give a broader overview of the key players in the market. In addition, the report also covers key strategic developments of the market including acquisitions & mergers, new product launches, agreements, partnerships, collaborations & joint ventures, research & development, and regional expansion of major participants involved in the market on the global and regional basis. The study provides a decisive view of the cognitive and memory enhancer drugs market by segmenting the market based on customer and regions. All the segments have been analyzed based on present and the future trends and the market is estimated from 2018 to 2025. By drug type, the global cognitive and memory enhancer drugs market is divided into Aricept, Razadyne, Namenda, Exelon, Provigil, Ritalin, Adderall, and others. Among these products, insulin is expected to account for the largest share of the market. By application segment global cognitive and memory enhancer drugs market is divided into disease treatment, academic performance, athletic performance, and others. The regional segmentation includes the current and forecast demand for North America, Europe, Asia Pacific, Latin America, and the Middle East & Africa with its further bifurcation into major countries including the U.S. Germany, France, UK, China, Japan, India, and Brazil. This segmentation includes demand for cognitive and memory enhancer drugs based on individual segment and applications in all the regions and countries. Some of the key players in cognitive and memory enhancer drugs market include Pfizer Inc., Eisai Co., Ltd., Allergan, Inc., Novartis AG, Shire, Johnson & Johnson, Takeda Pharmaceutical Company Limited, AlternaScript LLC, Cephalon, Inc. (Teva Pharmaceutical Industries Ltd.), and Ceretropic.